I had high hopes for this book, but was a bit disappointed. The first 70 pages—roughly a third of the book—were extremely slow. The murder occurs, but there's no progress toward finding the killer. Instead, Inspected Montalbano (the protagonist) is featured prominently—or more accurately, his relationship problems with a woman named Livia, with whom he has had an on-again off-again relationship for years. Montalbano is kind of an interesting protagonist. In this book he seems rather gloomy, but passing references to other events and other cases implies that he's not usually so glum. The weather and access to fresh fish seem to affect his moods greatly, and he takes pleasure in a good mid-day meal, regardless of the cases he works. 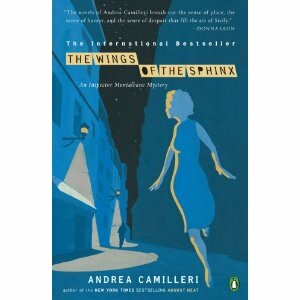 I found Camilleri's inclusion of Montalbano's internal monologues to be quite funny as well. He also plays a crazy cop with unusual "interrogation" techniques in the examination of one suspect, and yells out multiplication tables to get the suspect to stop crying—an extremely funny scene. I felt that the plot twisted and turned but ended up sort of where you would expect, despite some surprising instances that interrupt one's first thoughts. I would like to read the first in this series to get a better sense of Camilleri's writing and characters before passing further judgment; I found this book a bit difficult to follow at times. Ahaha, Jess when I read "poissonally in poisson" I read it like the world "fish" in French. Great review! Hmm sounds like I won't be picking this one up! Any good recommendations for a good mystery? I'm always wanting to try a good mystery but never know where to start!